A few years ago, Candice Hayden’s idea of a cabin in the mountains was fairly traditional. 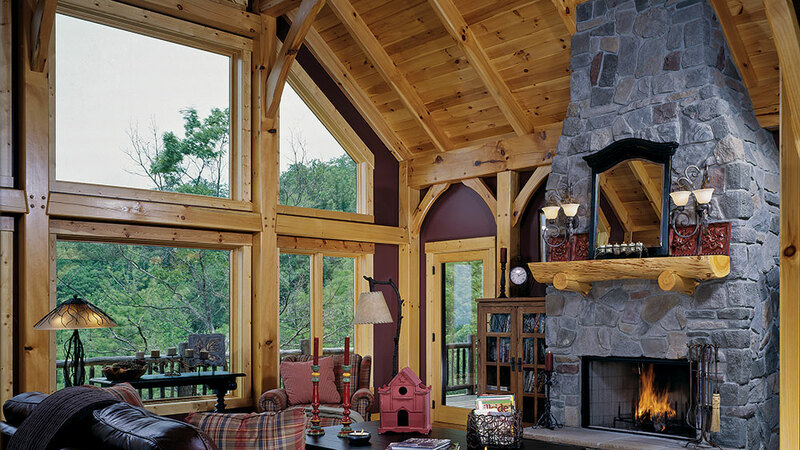 She envisioned it being heavy with wood, most likely logs, and dark and warm and cozy — reminiscent of a vacation home she once owned, deep in the woods of Maine. As a painter and sculptor, the Florida resident had long enjoyed escaping to the artsy enclave of Asheville, North Carolina, but it wasn’t until boyfriend Michael Kingsley suggested taking a trip to Linville Gorge in the Pisgah National Forest that Candice first saw Blowing Rock, a quaint little town just off the Blue Ridge Parkway. It was love at first sight. “Within months, we were taking trips to look for a cabin,” Candice recalls. With her image of a rustic, log cabin in mind, Candice intended to find a home already built. As fate would have it, however, a relaxing walk in the woods one afternoon led her in an entirely new direction. She and Michael had rented a cabin outside of Blowing Rock from which to stage their search, but they found nothing they liked. Without a moment’s hesitation, Candice snatched up the property. Within a few months, she’d found a builder, had plans in hand and was all set to build. Then, once more, fate intervened. Her deal with the first building company fell through. In retrospect, Candice says she couldn’t be happier that it did. Candice promptly scrapped her existing plans and, with a few minor tweaks to Kirkpatrick’s design, had the timber-frame plan she wanted: a 4,018-square-foot, saltbox-style, hybrid timber-frame home, perched on the edge of a sloping lot, with three tiers of deck extending out over the Johns River Gorge below. The overarching design of the home attends to what Kirkpatrick describes as “designing to the community,” meaning it blends with its Appalachian surroundings. 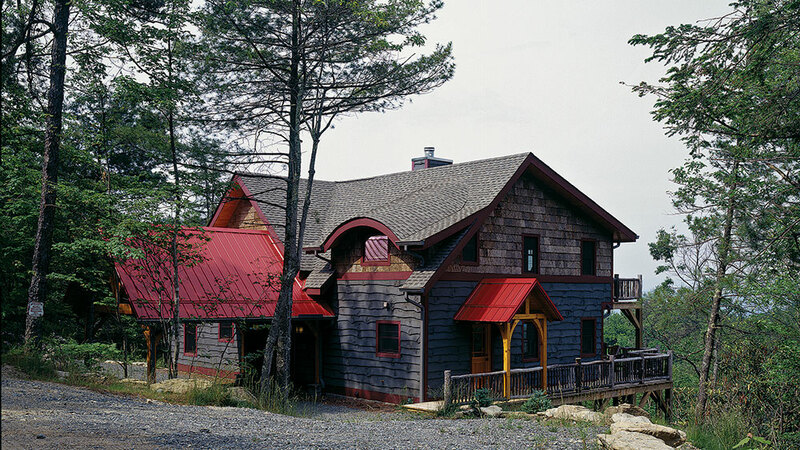 The exterior of the home features white pine, featheredge siding for the lower portion of the walls and locally harvested, poplar-bark siding for the upper portions. 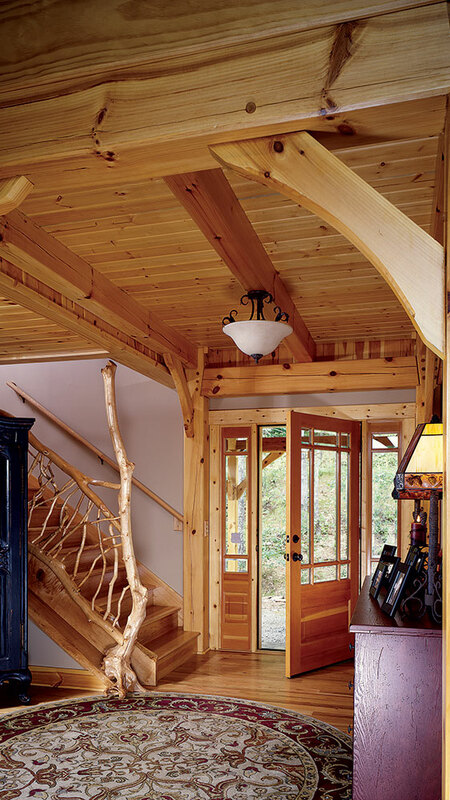 Inside the home, with natural white pine used for the timbers, the trim and the tongue-and-groove ceilings provide the abundance of wood that Candice craved, while keeping the home airy and bright. For the interior, Candice admits that she and Kingsley shopped for it all over the course of a long weekend. Candice bought all of the home’s lighting fixtures online from Lamps.com, the furniture from Broyhill and many of the throw rugs from Capel Rugs, a North Carolina company. “We just did this by the seat of our pants,” she explains. : The home’s unassuming saltbox design belies the 4,000 square feet of interior space. 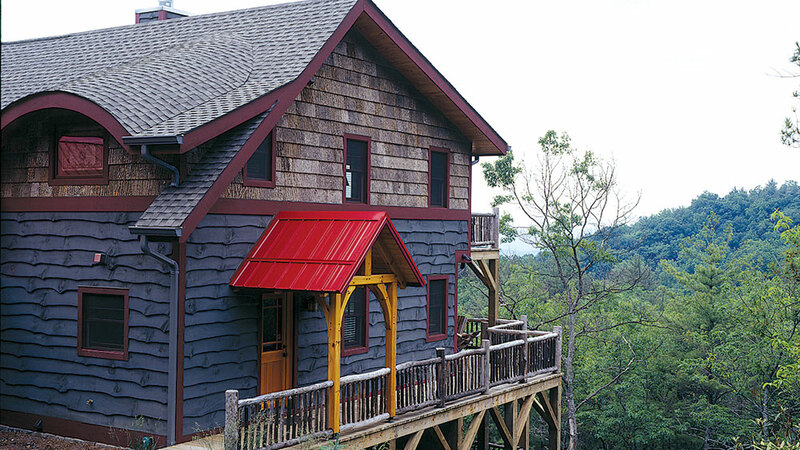 Asphalt shingles and red metal on the roof give the home a unique look. The 28-foot cathedral ceiling in this great room remains open and unobstructed by trusses because of mid-span plates running perpendicular to the roof rafters. Creativity took the lead in project manager Ben York’s creation of the rhododendron and mountain laurel stair railing. 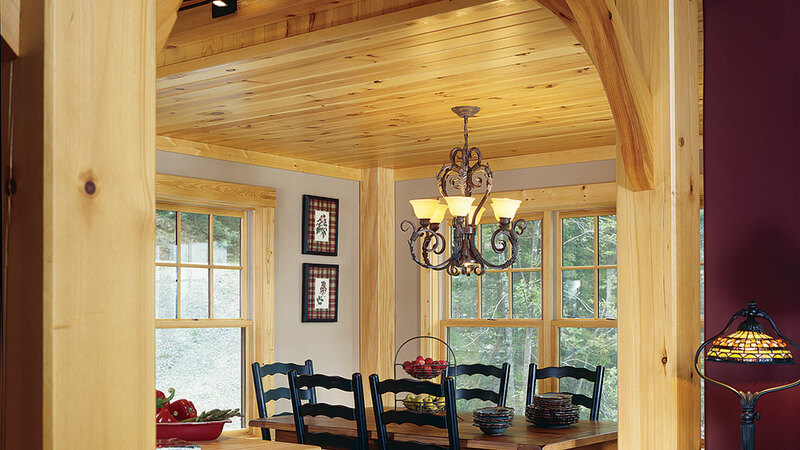 The materials were found locally and made by hand with mortise-and-tenon joinery. “The fun part about this whole project is that we let people get creative,” Candice says. 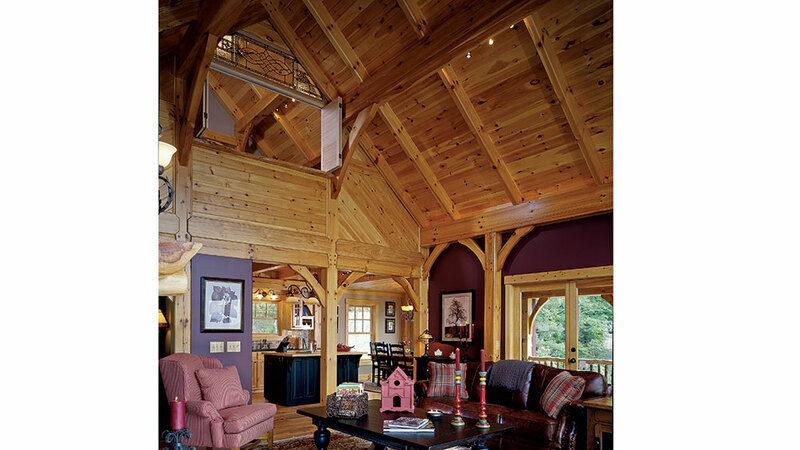 "The beauty of a timber frame," Candice says, "is that when you have a cabin, sometimes the wood becomes too much. This is a perfect combination." 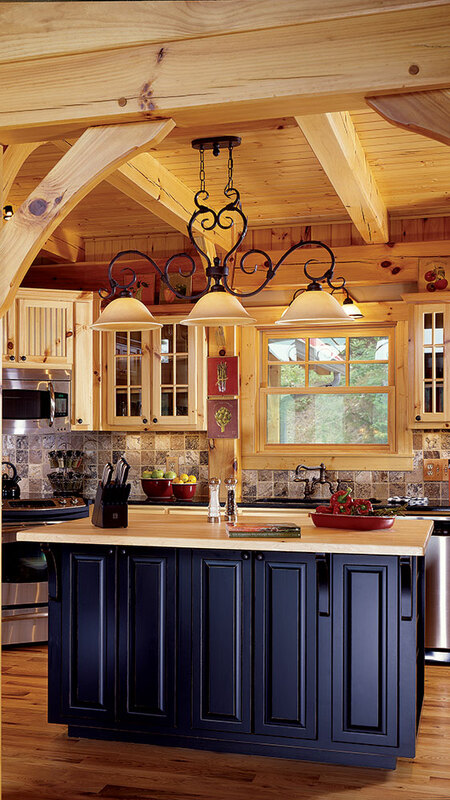 The black-painted island gives the kitchen a weighted focal point while the white pine cabinets keep it bright and open. The original plan called for an open loft, which was altered to include a bedroom and private bath. A custom-crafted, stained-glass window and bifold shutters provide privacy to the bedroom while retaining the loft’s open feel. 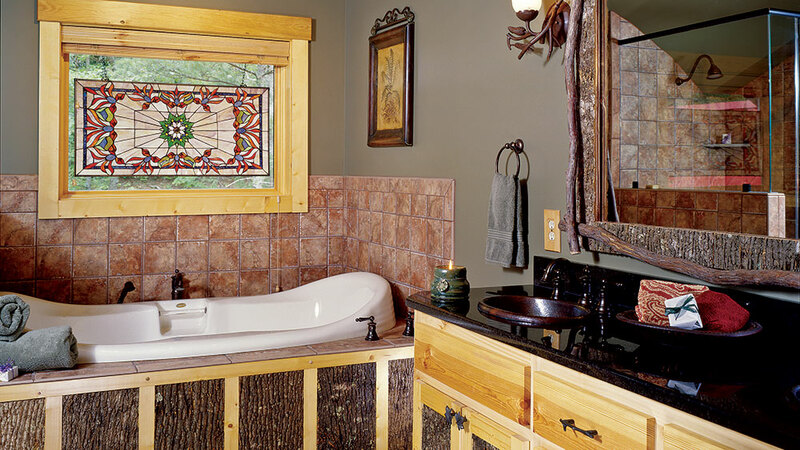 The master bathroom shines with creative touches. The cabinets are constructed of curly maple, with leftover poplar bark from the home’s siding inserted as textured panels. The mirror was handcrafted by project manager Ben York. Using an unframed piece of mirror glass, he constructed a poplar-bark frame, then adorned it with twigs. Altering the original design, the homeowner opted for a bedroom and bath in the loft area beneath a 16-foot cathedral ceiling. Throughout the home, No. 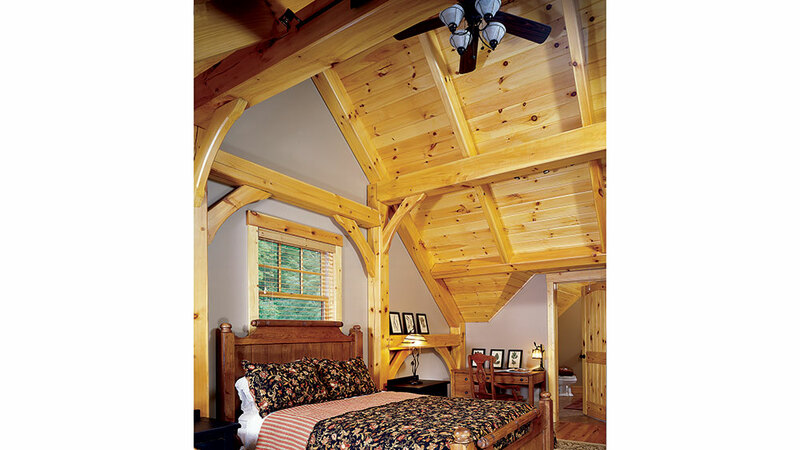 2 white pine was chosen for the timbers, the tongue-and-groove ceiling and the trim.